An excerpt from William Horwood's Gaude flore virginali recorded live in concert, 26/03/10, St Mary Immaculate Church, Waverley. 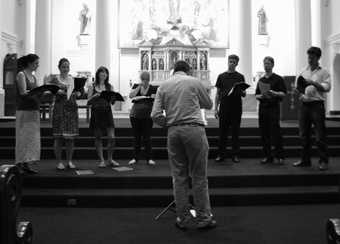 The Parsons Affayre was established in 2009, and is Australia's newest vocal ensemble specialising in the performance of Renaissance Polyphony. The group particularly focuses on the performance and recording of neglected repertoire of that period. Although the music of the renaissance period is a primary focus. Last year The Parsons Affayre completed a project of rarely performed Russian sacred music showing their great versatility and musicianship. This unusual repertoire was enthusiastically received and will now be a second area of focus, in fresh and exciting projects and concert programmes. Since its inception, The Parsons Affayre has featured on all the major classical music radio stations in Australia and has attracted the very best early music specialists who generously give their time and expertise to perform in these unique projects. Find out more about our latest release for Christmas 2013. Venue: St James’ Church, 173 King Street, Sydney.